Before I post the very first My Earth Monday task, I just had to tell you all how much of a success Earth Hour was in our home! Roomie and I first thought that the kids would freak out - they're not too keen on darkness like most kids - so, at first, we had the tv on with their favourite video game, Mario Sunshine, playing. 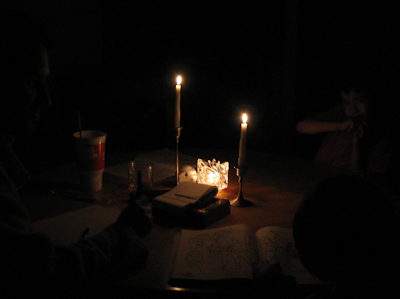 I then lit some candles, turned off all the lights, and settled myself at the diningroom table to do some writing. Remarkably, as soon as the lights went out, the tv suddenly sounded really loud, you know, like that annoying, obnoxious uncle at your family Thanksgiving dinner you wish you could uninvite or yell at to shut up. Soon bored by the game, Lam and Mini grabbed their crayon box, paper and colouring book from the crafts drawer and hunkered down with me at the table. Finding himself alone at the game, Roomie saved the game, turned off the tv, and joined us with his own writing material. I gathered up some snacks and drinks for us to enjoy together. The next hour was spent with us talking, eating, laughing and just being a family around the candlelight. It was a rare and special treat. After the timer signaled the end of our Earth Hour, we decided to keep the lights off a little longer, and Roomie and I extended bedtime. The kids have asked that we do Earth Hour again. This may just become a regular family activity, and that's just fine with us. Good for the family, and good for the environment. Well, my Earth Hour wasn't much different than any other evening except that hubby was out of town. The young man goes to sleep at about 8, so we just turned off all the lights and snuggled in bed. I fell asleep (like most nights) and woke up after 9. It's anywhere between 7:30 and 9. We try for 8. Before I started back at work, it was much later. Now that he has to get up at 7am 3x a week, he's tired earlier. Thanks for sharing, it sounds like a new tradition were born! Imagine how it were 200 years ago, sitting in candle light every evening? Yes, a new tradition... which reminds me, I should go and buy some more beeswax candles for our next Earth Hour!